The Great Spirit consists of all the souls in the world, living and dead. Whether a person believes in the Great Spirit or not, or has ever heard of the Great Spirit or not, does not matter, because there is a bond between all souls that does not depend on human knowledge or belief. For the Great Spirit is the spirit of greatness that is in all of us, and the spirit of greatness of man is inspiring mankind forward to the threshold of reaching out to explore the universe. No soul is more or less important than another soul, but there are some souls that can teach other souls many things. Sometimes the souls of those long dead cry out to be heard, so that living souls can learn from their experience and wisdom. I have heard a soul or maybe more than one soul reaching out to me for several months. It was my belief that this soul was burned at the stake. I felt the voice was coming from 14th Century Europe. I also got a vibration that this soul made some kind of intellectual discovery. It was my belief that this discovery was the initial formulation of a theory of Evolution, similar to Darwin's theory formulated in the 19th Century. Unfortunately, I envisioned that Church authorities of the time took a dim view of this theory, and so this unknown soul was convicted of being a Heretic, and burned at the stake. All of his writings were destroyed, and his name was completely lost to history. Only a couple of weeks ago, I was doing some research on Galileo, when I stumbled across the name of Giordano Bruno (1548 - 1600) from the 16th Century, who probably had nothing to do with evolution theory, although it is possible that he did some work along these lines, and this and possibly other aspects of his intellectual achievements were completely destroyed, while his work on astronomy and his description of the Universe were preserved. I realized immediately that this soul had been trying to contact me. Perhaps there were several others who lived during these dark ages*, who also made scientific discoveries which were similarly suppressed who were also trying to reach me, and they are communicating with me as a group. For how can a person of today know the difference between a so-called heretic and a scientific genius after he has been burned at the stake if the history of his life has been obliterated? But in this case it was not, and so we know. It was lucky for Charles Darwin that he wrote his theory in the 19th Century England instead of the 16th Century Italy. As can be seen from the above biographical links, Giordano was an intellectual giant. Working from the meager information available to him from the research done by Copernicus (1473 - 1543), and other astronomers, using the first primitive telescopes, he was able to describe the Universe in terms that are in general agreement with most astronomers today, over 500 years later, who have the advantage of much more powerful telescopes, infrared and radio detection devices, advanced photography equipment, and funding and encouragement by governments and private benefactors, instead of being terrorized, harassed, imprisoned and ultimately burned at the stake by the church-government. Basically, what he theorized was that the stars were actually distant suns, similar in makeup to our sun, that might have planets revolving around them, and that this universe had always existed, and logically could not be created by God or the men who created the God concept. This concept of the Universe were far advanced compared to Copernicus, Galileo (1564 - 1642), and other astronomers of his day, who described how our solar system worked, and that was about it. Yet Giordano is much lesser known to students of history than these contemporaries. One reason for this is that the historians of his day sometimes associated his ideas with those of astrology and mysticism, because their own ignorance caused them to think in these terms when trying to explain his ideas which they found strange and did not understand. Another reason is that throughout history since his death the Catholic Church and Christianity in general, must have a great deal of influence with the media, with historians, with educators and teachers of history, in suppressing his name from more general knowledge by the public. I would never have found his name if it were not for the internet, which can be thought of as the communicative medium of the Great Spirit. After all, there is somewhat of a glaring logical contradiction in this episode of history between the actions and words of those who claim that the pain and suffering of the alleged Jesus Christ when he allegedly crucified, he washed away the sins of mankind, because he was totally innocent of any wrongdoing or sin himself. Which is more painful, crucifixion, or burning at the stake? And who is the greater Martyr, Christ or Bruno? And to top it all off, the faithful followers of Christianity have completely forgotten all of the atrocities committed by Church leaders over the 2065 years since the time the New Testament was written, as if a black hole had swallowed up all of history during that time. But the Great Spirit remembers all of history, not selected or concocted history of the purpose of the manipulation of the ignorant masses. I would say that Christianity has set back scientific discovery and progress over a thousand years, and was the cause of the Dark Ages*. The Government during the days of the Roman Republic and the Roman Empire encouraged public education although they did not use tax money to pay for it. But when Christianity took over as the dominant ideology in Europe, public education was eradicated for over a thousand years. It was the invention of the printing press by Gutenberg in 1483 that gradually brought it back. Giordano lived during a time when Italy and much of Europe was ruled by the Catholic Church and Christianity, to include the Lutheran movement and other Protestant movements. You can think of the people in charge in those days as a bunch of ignorant sadistic pigs, who were also self-righteous and believed themselves to be doing God's work. They not only controlled the Church, but also for all practical purposes, the government, particularly in Italy. Things these pigs could not stand in the slaves and serfs they ruled were high intelligence, leadership ability, and non-conformity. The most important two values Christian churches stress to its believers, are conformity and giving money to the Church. If you do not believe this, go to a Catholic Mass or any other Christian service, and you will see that everybody is taught to stand, kneel, sit, sing, and pray in unison, and if there are any non-conformists in the crowd, they stick out like a sore thumb. In circa 1600 in Italy, being a sore thumb could be punished by burning at the stake. This of course caused cash receipts to go up at Mass, since people were terrorized and extorted into going to church every Sunday, giving money, and saying Amen to everything the priest or preacher said, so they might avoid being the next witch or heretic that gets taken out and fried. But Christianity is not dead yet, and is always trying to figure ways to take us back to the Dark Ages and their heyday. If you don't believe this, check out recent statements by Arizona State Senator Sylvia Allen, who feels that the way to solve America's problems is to require everybody to go to church on Sunday, instead of cleaning up all the corruption and stopping the treasury looting in Washington. 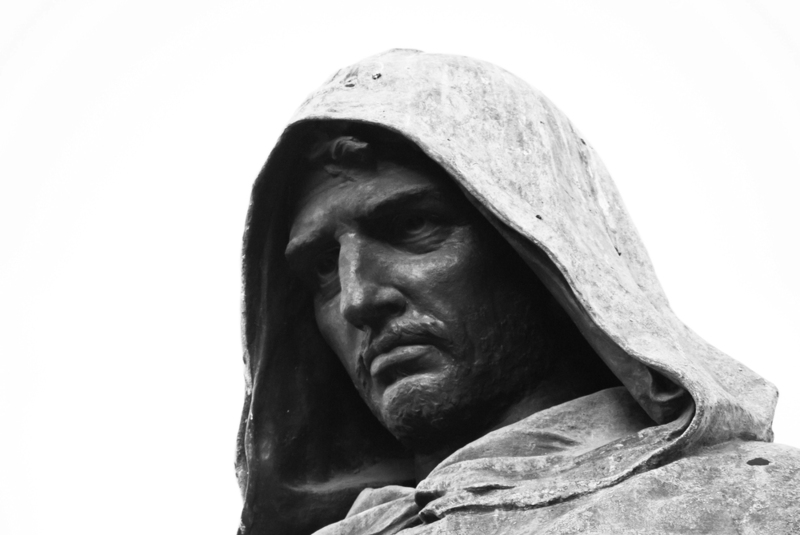 Giordano Bruno was a martyr for the cause of the advance of science leading to the exploration of the universe by mankind, and the future greatness that goes with it. In addition he was a martyr for the cause of logic, reason and fairness, and his lengthy imprisonment and horrific death was of course illogical, unreasonable, and unfair. One of the top priorities of the Great Spirit is for man to explore the Universe, because the Great Spirit is presently confined to Earth, and wherever man goes, so goes the Great Spirit with him. Christianity, on the other hand, states often in the Bible, that mankind is doomed, and speaks of Armageddon and Apocalypse often, particularly in the Book of Revelations. And as this article shows, Christianity also can cause its predictions to come true, since its influence causes people to act in the illogical way necessary to bring about mankind's end. On the other hand, belief in the Great Spirit and its Revelations by the general public will bring an end to man's petty bickering over primitive, obsolete religions, and other unnecessary causes of disagreements and wars, and point a united mankind on a path to Greatness, which includes the exploration of the Universe. The internet has made it possible for the people of the world to communicate with each other so these goals can be accomplished.